Is there sufficient material in the tanks? Is the pressure at the outlet gauges changed from normal? Do a ratio check to determine flow and ratio. Check to see if there is flow from both pumps. Check to see if the check valves are cutting off material evenly when the trigger switch is de-activated. Measure the volume output of each material. If ratio check is not correct, the problem is in the meter. Is air entrapped in pumps or hoses? Check to see if the drive chain is loose or worn. If chain is removed, is one of the pump sprockets frozen? Can the pump be rotated by using a large pliers on the sprocket? Clean off the dispense manifold with plastic mixer nozzle removed. Pump material into waste container to verify smooth, air-free flow of both materials. Wipe head clean and coat the dispense manifold with compatible lubricant. Place new plastic mixer nozzle on applicator block and secure with mixer retainer nut. Turn off motor controller and disconnect the plug from power. Remove plastic mixer nozzle and discard. Clean head of applicator and coat the threads and tip with compatible lubricant. Lubricate grease zerks on applicator head. Fill until the lubricant comes out of the ports (holes) where the mixer is attached. Wipe away any displaced material. Lubricate grease zerks on the side of each pump. The chamber being filled is between the shaft seals. Open the end of the bleed valve on the bottom of each pump. Fill the zerk on top of the pump until fresh lubricant comes out the hole in the side of the bleed valve. Verify that tanks are over 1/3 full. Never permit either material tank to get below approximately 1/3 full. A common problem is cross-over (one material crossing over into the other material’s manifold and/or hose). Damage and cost from cross-over is NOT covered under AST Corporation Warranty. Cross-over can be avoided by carefully following instructions. If the gauges display pressures that “peg” the needle, immediately remove power from machine. Do not install a disposable mixer nozzle to the dispense manifold until positive air-free flow is achieved from both outlets of the applicator block tip. Air can be trapped in hoses during filling of an empty system. To avoid trapping air, arrange the hoses to obtain a continuous gradual upward slope of the hose from the pump outlet to the applicator while the system is pumping at low speed. Point the dispense assembly upward to let the material push the air out. 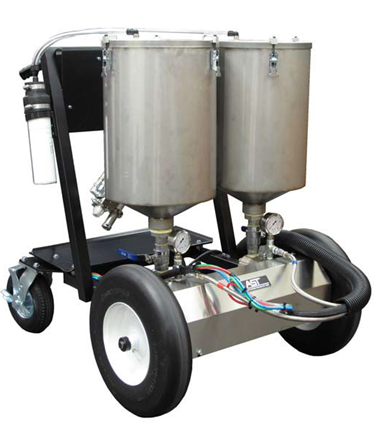 Two zerks are provided on each side of the dispense manifold, where the static mixer is attached to the applicator. These are provided so that the operator can remove the mixer and fill the ports of the manifold with a compatible lubricant. This helps prevent problems with material hardening in the manifold, and should be done when the unit is left unused for any period of time. The gearotor pumps are lubricated in two places. Both should be lubed daily. When the zerk on the top of the pump is filled, the bleed valve at the bottom of the pump must be opened. Lubrication is complete when fresh lubricant is pushed out from the bleed valve. The maximum cord length that can be used is 100 feet using 14 gauge wire. Questions?? Call us! If you’re with the machine, we can walk you through the procedure for start-up and shut-down. Ask for Technical Assistance at (763) 592-2060. Remove and clean any material residue or film with compatible solvent (damp pad only – do not pour solvent). If leakage appears at shaft, replace seals. Remove check valves. Disassemble & clean. Replace o-ring if necessary. Clean the threads and ports of the dispense manifold. If necessary, it can be removed and soaked in a compatible solvent. Remove the retainer cap or mixer nozzle. Trigger applicator; two separate beads of material will appear; compare for correct volume.